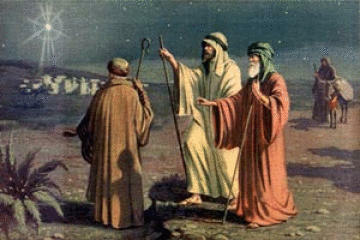 The Three Wise Men are coming tonight! After Christmas we put the Three Wise Men statues as a centerpiece on the dinning room table so the kids know - it's no over yet "faltan los Reyes." We’re still waiting for the Three Wise Men. On January 5th, the kids will cut grass or greenery and put it in a box under their bed for the camels to eat. Their "wish list" is placed on top of the grass. Once they fall asleep, we put their gifts from Los Reyes in the box and we throw out the grass. The Three Wise Men arrive before dawn on January 6th and quietly leave their gifts for the children, symbolic of the three gifts that were given to the baby Jesus by the Magi, while their camels enjoy their snack. In Puerto Rico, where I grew up, January 6 is the day that children receive their Christmas gifts, in commemoration of the Magi's visit, but we give the kids Christmas presents from the family and us on Christmas day. Later in the day a special dinner is prepared and friends and relatives join in the festivities. Tomorrow we’ll have 3 King’s cake for dessert.